Chopin is a directional integrated LED luminaire which casts a subtle warm white light. This small square fixture features a stainless steel finish. 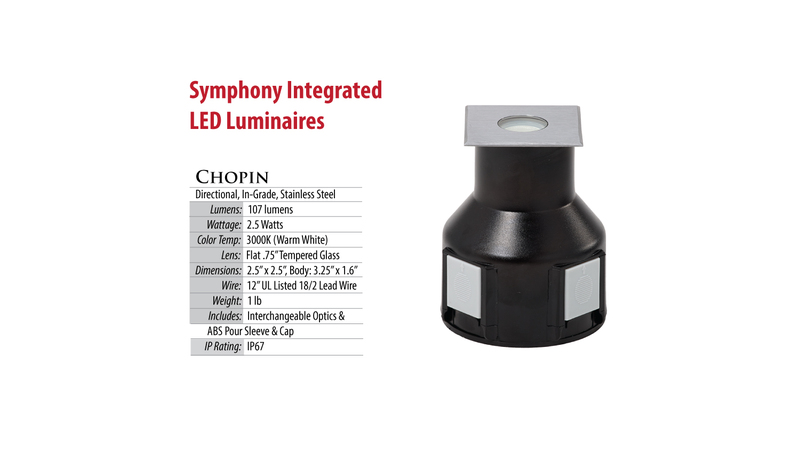 Chopin LEDs have a minimum illumination of 1 meter (3 feet) and include an ABS pour sleeve to assist in installation and anchoring of the luminaire body. 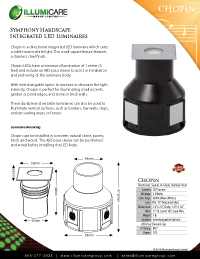 With interchangable optics to increase or decrease the light intensity, Chopin is perfect for illuminating small accents, garden or pond edges, and stone or brick walls. These durable and versatile luminaires can also be used to illuminate vertical surfaces, such as borders, low walls, steps, sunken seating areas, or fences. Chopin can be installed in concrete, natural stone, pavers, brick, and wood. 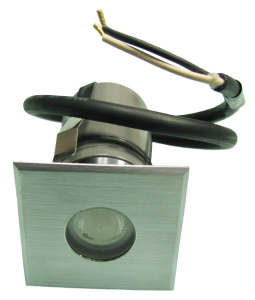 The ABS pour sleeve can be positioned and wired before installing the LED body.